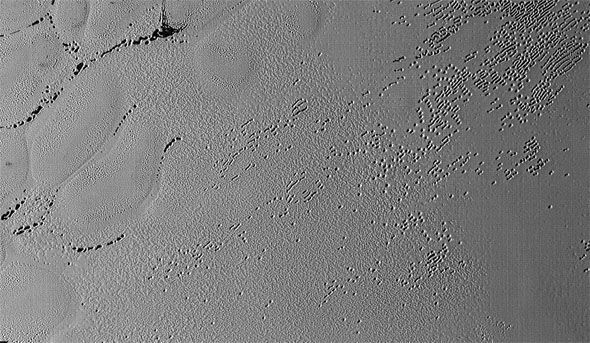 The most recent image, from the center of Pluto’s "heart feature", display the plains’ mysterious cellular pattern along with rare clusters of small pits and troughs. But the high-resolution image has displayed no sign of even any small impact craters, which puzzle the surface of the rest of Pluto. Researchers believe this area, informally recognized Sputnik Planum, and is composed of unstable ices for instance solid nitrogen. They hypothesize the pits and troughs, which are usually hundreds of meters across and tens of meters deep, are perhaps made by sublimation or evaporation of these ices. Though, the reasons for the outstanding shapes and alignments of these landscapes are a complete mystery. A NASA spokesperson said: "Adding to the intrigue is that even at this resolution, no impact craters are seen, testifying to the extreme geologic youth of Sputnik Planum." 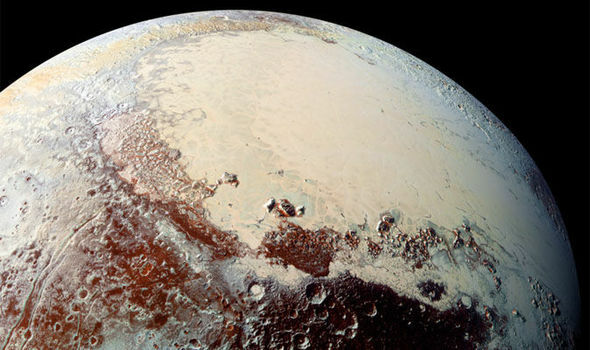 Hal Weaver, New Horizons project scientist with Johns Hopkins Applied Physics Laboratory in Laurel, Maryland, said: "Pluto is weird, in a good way. The pits, and the way they’re aligned, provide clues about the ice flow and the exchange of volatiles between the surface and atmosphere, and the science team is working hard to understand what physical processes are at play here.” The images being directed back by the NASA’s New Horizons unmanned spacecraft will send back more images with higher resolution over coming months after the close fly by back in July. In the meantime, one alien hunter who is also examining the pictures claims to have found proof of aliens landing on Pluto and he also claims that a spacecraft has been caught by New Horizons. 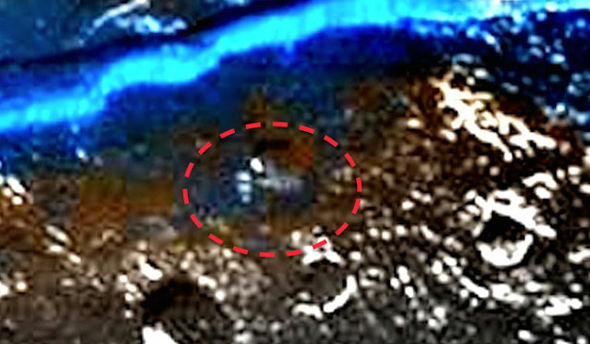 Scott C Waring reported to website UFOsightingsdaily.com that he can see a "space shuttle-like craft" and also mentioned a picture with the object ringed. The New Horizons group described an extensive range of findings about the Pluto system up to now in its first science paper, just released. “The Pluto System: Initial Results from its Exploration by New Horizons,” directed by mission Principal Investigator Alan Stern, appeared as the main story in the Oct. 16 issue of Science, only three months after NASA’s significant first exploration of the Pluto system in July. In this issue scientists also mentioned the discovered proof for a water-ice rich crust, numerous haze layers above the surface in Pluto’s atmosphere, and that Pluto is slightly larger and a bit more ice rich than anticipated.